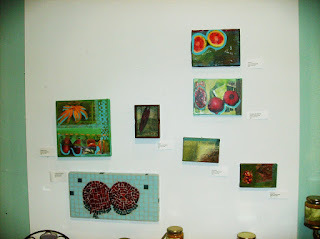 I had a hand full of pieces at the 4th Street Studio "Under $100 Show" this past weekend. Proceeds from the show went to a Columbus Food Pantry. I sold four pieces so I was happy! "Gooseberry" Sold! I had fun with this one. 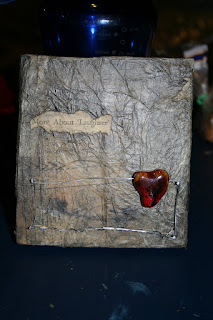 "Laughter in the heart" Sold! this one was new to me. A collage of fabric patterns and wire. I read earlier how they predict only happy art will sell for awhile. Well what if I combine the too. that is what alot fo folks are feeling right now right? mixed? It sold! Now to make another with the same approach! I think the next stage is to make more fruit pieces. I like working with the photos and mosaics of the rare fruit. 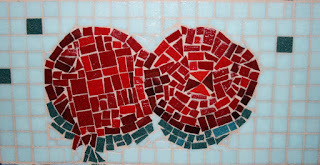 I just finished the Pomegranates made with glass mosaic tiles. 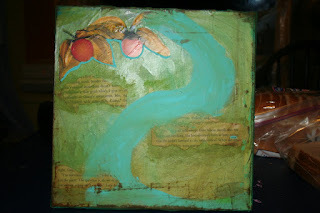 I started one of a persimmon last night. Cant wait to see how that turnes out!